We had a great summer raising our Muscovy duck herd, with twenty six ducklings successfully raised to maturity. Thanks to Pat Hanson at Andtbaka Farm (The Farmer's Gate) for doing all the dirty work of harvesting and plucking! The freezer is full and we have lots of duck livers for pate. So many livers that we reserved 9 livers and made this fabulous dish. It's both low carb and perfect for Will's Low FODMaP diet. My serving was presented with spinach on a bed of sauteed cabbage and Will had his on a bed of rice. Prepare all the vegetables & livers. Season livers with salt, pepper & Thai pepper flakes. Set aside. Melt duck fat in a large pan or wok. 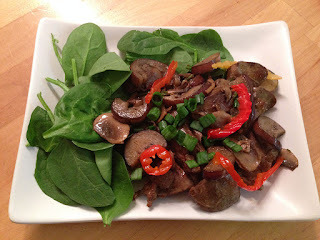 Add the mushrooms and saute over medium heat until wilted, then add the eggplant slices. Saute until starting to brown. Remove from pan. Melt 1/4 cup butter in the pan. Saute the ginger for just a minute and then add the livers. Cook until just brown on both sides. Squeeze lemon juice over the livers, then brandy. Add back the vegetables, and cook just enough to warm it all up again. Serve over rice, spinach or sauteed cabbage. Garnish with green onion and pickled banana peppers.